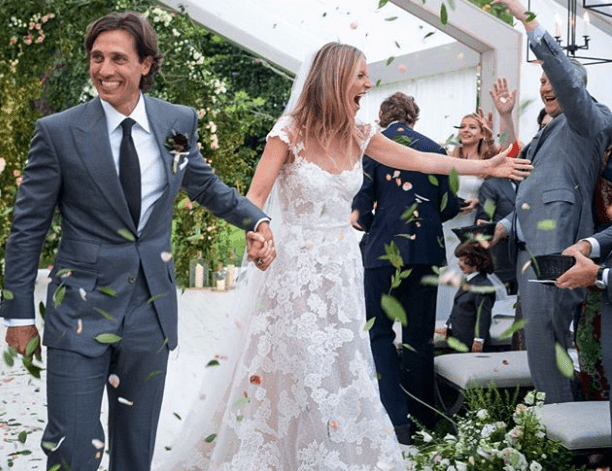 If you didn’t get the memo, boys, Gwyneth Paltrow is once again a married woman after she tied the knot with TV writer Brad Falchuk this past September 29. She waited before revealing her incredible dress, a white Valentino specially designed by the brilliant Pierpaolo Piccioli for the 46-year-old actress’s wedding. Besides the intricate lace detail that you can see, it featured tasteful sheer cap sleeves and an open back. The outfit was topped off with a simple veil for a refined look. It’s quite evident why she’s considered one of Hollywood’s most beautiful. Paltrow, also the founder of Goop, shared pictures on the Goop website. The wedding was held in the Long Island town of Amagansett in the presence of some 70 guests. She chose to wear her hair down for the occasion and selected none other than the deft hand of Gucci Westman. A classic choice for a classy bride! The bride got out of her dress for a more casual look during the reception and donned a Stella McCartney jumpsuit, a similar white but a shorter look than her dress. This is the same designer who did Meghan Markle’s dress for the Royal wedding reception. The outfit, designed by the same designer as Meghan Markle’s reception dress, was completed with a cape. Apple, Paltrow’s daughter, and her step-daughter, Isabella, wore matching strapless white gowns made by Monique Lhuillier. Before they tied the knot, Paltrow and Falchuk dated for three years. She was previously married to Chris Martin of the band Coldplay. He is the lead singer. Martin and Paltrow divorced in 2016.